As of 1925, Major General Peter Porter was the only man who ever resided in Niagara Falls who was a member of the cabinet of a President of the United States, and General Porter was also a national character in military affairs, as well as in public life in general, and as a lawyer and business man he bulked large for beyond the confines of the Niagara Frontier. He and his brother, Judge Augustus Porter, were the first and principal factors in the settlement and development of the Niagara Frontier during the first half of the 19th century. "A Representative from New York"
"Born in Salisbury, Conn., August 4 1773; was graduated from Yale College in 1791; was admitted to the bar and began practice from Canandaigua, NY; in 1793 held various local offices; Member of New York Assembly in 1802; moved to Black Rock, Buffalo, NY, in 1809; elected as a Democrat to the Eleventh and Twelfth Congresses, March 4, 1809, to March 3, 1813; declined re-nomination to the Thirteenth Congress in order to serve with his constituents in the War of 1812. He was a close personal friend of Henry Clay who appointed him chairman of House of Representatives Committee on Foreign Relations, and as such General Porter reported the resolution for the Declaration of the War of 1812. 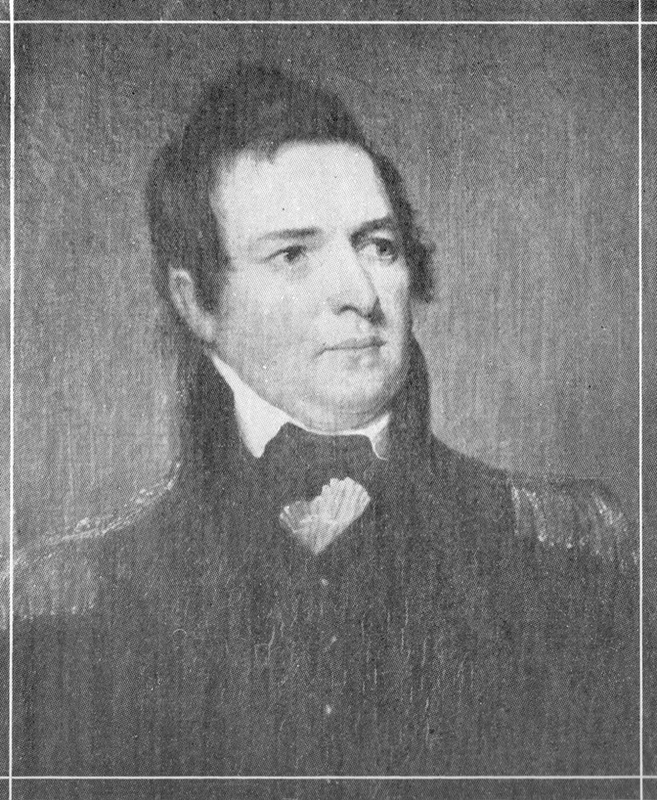 Served in the War of 1815; was offered the command of the United States Northern Army for the 1815, but the Treaty of Ghent put an end to hostilities. Next to Clay, he was the most prominent of the "War Hawks" leading the supporters of that war in the North, as Grundy led them in the South (the gentlemen from Genesee and Tennessee, as John Randolph used to refer to them). "In 1810 he was named as one of the committee in New York State to decide as to an inland canal from the Hudson to Lake Erie, as against the earlier plan of a Federal ship canal around the Falls of Niagara, of which General Porter had been an earnest advocate. His appointment on that committee was opposed on the ground that being one of the lessees of the Niagara Portage, he would naturally be strongly opposed to any inland canal, which would destroy the portage business. In spite of that opposition, he was name on that committee, and , satisfied that an inland canal would be for the ultimate best interests of the State, he voted in favor of it, regardless of the fact that his firm's portage business would be killed by the shorter route. "General Porter was presented with a gold medal under a joint resolution of Congress, of date November 4, 1814, for gallantry in the conflicts of Chippewa, Niagara, Lundy's Lane, and Fort Erie in Upper Canada, and a gold-handled sword by the State of New York, for the same services. He was re-elected to the Fourteenth Congress, and served from March 4, 1815, to January 23, 1816, resigning in order to accept the appointment as the United States Commissioner under the Treaty of Ghent to locate our northern border. He was Secretary of State of New York in 1815. "We was appointed by President John Quincy Adams as Secretary of War, serving from June 21, 1828, to March 9, 1829. "In 1830, or thereabouts, he was again elected to the New York Assembly for the purpose of adjusting difficulties that had arisen between the Holland Land Company and it's grantees. "In 1836 he removed to Niagara Falls, and died there on March 20, 1844. Within the limits of this space it is not possible to relate all of the incidents of much interest in the busy life of General Porter whose activities were national in character and importance. With is associates he initiated and carried on the early commerce of the Niagara Frontier and of Lake Erie at least. He held other public positions besides those mentioned by his grandson above, including that of county clerk of Ontario county. He travelled through the State and helped Governor DeWitt Clinton, its father, select the route for the Erie Canal. In 1814 he was made a brigadier general of volunteers by Governor Daniel D. Tompkins of New York, and was brevetted a major general after the battle of Lundy's Lane which was fought July 25, 1814. In 1815, President James Madison appointed him a major general in the United States army. Beginning in 1816, together with his brother, Judge Augustus Porter, he owned Goat Island and much of the land immediately adjoining the rapids and falls of the Niagara river, which territory is now included in the city of Niagara Falls, and was purchased when the State of New York established the Niagara Reservation in 1885. They also owned land near the Niagara river in the Black Rock section of Buffalo at the American end of the international bridge. Fort Porter at that point, which was removed to make way for the entrance to the Buffalo-Fort Erie Peace Bridge, was named after General Porter. Late in life, General Porter married Mrs. Letitia Grayson, daughter of former Attorney-General Breckenridge of Kentucky. She died at Black Rock in 1831, aged 41 years. They had one son, Peter A. Porter, who became distinguished, being the commander of the Eighth New York Heavy Artillery which went from this section to the Civil War, and Colonel Porter was killed at the battle of Cold Harbor June 3, 1864. General and Mrs. Porter also had one daughter, Elizabeth Porter. As before stated, General Porter was a member of the International Boundary Commission which in 1819 established the present boundary between the United States and Canada, which, at this point, is located 200 feet out from Goat Island which the Porter Brothers and their descendants owned from 1816 to 1885.